Died: 6th February 1915; age 17; Died of Dysentery – No. 13 General Hospital, Boulogne. Eric contracted the illness from his service in the trenches. He was fully expected to recover, and had been sent from the front with a view of returning him to England. Residence: 55, Alan Road, Ipswich. Date of Entry Therein: 8th November 1914. 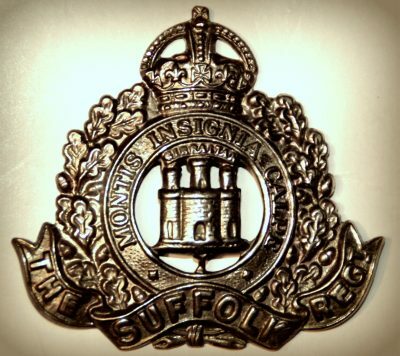 Regiment: Suffolk Regiment, 1st/4th Battalion. Medals Awarded: Victory, British War & 1914 Star. Relatives Notified & Address: Son of William & Matilda Bishop, of 55, Alan Road, Ipswich. 1901 55, Alan Road, Ipswich. Eric was 3 years old and living with his parents & brothers. William Bishop, 33, a Boilermaker, born Ipswich. Matilda Emily Bishop (nee Graystone), 33, born Chelmondiston, Suffolk. Stanley William G. Bishop, 12, born Ipswich. Albert Victor Bishop, 6, born Ipswich. 1911 55, Alan Road, Ipswich. Eric was 13 years old, an Office Lad. He was living with his parents & siblings. Victor, 16, an Apprentice Engineer. Ruby Vera N. Bishop, 3, born Ipswich. Soldiers’ Effects to William Bishop – father. Eric is also remembered on the Orwell Works Memorial, Ransomes Sims & Jefferies and Holy Trinity Church Memorial ,Ipswich.